SFMOMA invited me to create an installation in conjunction with their exhibition The Utopian Impulse: Buckminster Fuller and the Bay Area. Having always admired Fuller’s work, I jumped at the chance to honor his creative legacy. 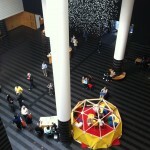 In preparation for the project, I studied Fuller’s work as well as the museum’s demographics for Free Family Day, the day the piece was to be installed. 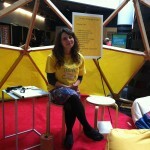 After creating some initial prototypes and consulting with museum staff, we decided on The Utopian Kindness Project (Dymaxion Village), a geodesic dome situated in the museum’s atrium, in which participants would swear an oath to live by Fullerian virtues, and to enact them in the museum space. After experiencing the museum’s exhibits, participants returned to the dome to report back on their utopian deeds, and recorded them in an archive for future generations. 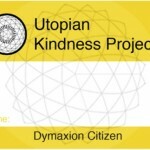 The front of the name tags distributed to all Utopian Citizens. The back side of inductees’ name tags, including instructions for Utopian Citizenship. 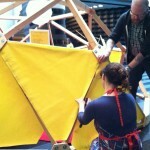 Working on installing the dome with SFMoMA staff. 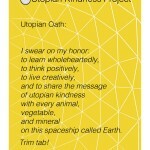 The Utopian Oath, inspired by R. Buckminster Fuller’s dedication to experimentation, innovation and progress. 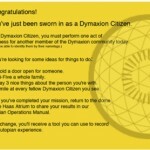 View of the Dymaxion Village from above.